Pay off that debt and live the life of being debt-free! I am envious. Have you heard that Move to Portugal is going to be debt free at the end of the year AND is quitting her cubicle job??? “Life is too short”, is her current motto. I love it. See what being debt free can mean? It’s super awesome. Me… *sigh* has kind of fallen from the debt free successes. Is still tied down to debt (aka – no job quitting yet). And had to drain our EF down to near null. Not tragically, but yes… Hawaii is currently on the back hold (hear the masses shreek!). Hear is the good new peeps. Our housing complex is currently under a lawsuit against the builder. It’s been two years now. Meaning, that it is in mediation, we win and settlement is soon to be provided. If it comes before April, it means we are going to Hawaii on schedule. Worse case, if it does not happen… we have to set back our Hawaii trip for a later day. The other good news: the debt snowball is still on schedule. We didn’t have to take from our regular expenses to pay for the plumbing. We are still pushing money towards the drastic debt total. We just don’t have that EF. But we are building it back up. I remain thankful that we still have our jobs, health, and if we stay on snowball track will be debt free within 4-5 years. All is good. So what do you do to slough off some of this financial stress???? 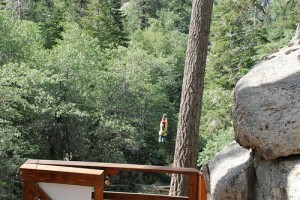 You take your son zip lining in Big Bear for his birthday surprise! (he has no idea! Although we keep telling him that he gets to spend a day with his parents for his birthday – lol). Wish us luck! 80-ft high suspended between two big trees. It’s all kid fun! Have a great weekend! And I will update you with my flying adventure. This entry was posted in Finances on 2009-10-09 by Christine. 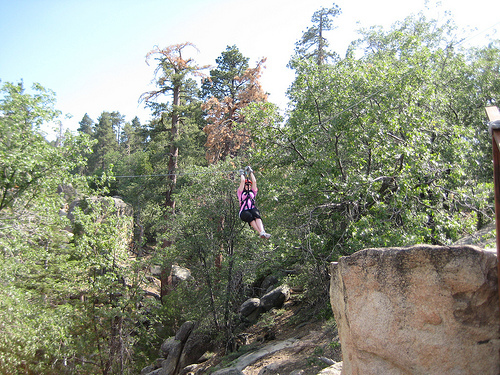 All I heard was “blah, blah, blah ZIPLINING!” I wanna go!!!! 🙂 Sounds awesome. I believe Revanche is in our neck of the woods, too. An IE get together, eh? Here’s the link to where I announced our debt freedom and why we did it and all that—it gives a bit more details than the EOD provided on his website. Thanks again!! I can’t wait to read through your blog! Thank you for all the wonderful info. I did check out your blog and am quite envious of the vast progress you made in such a short time. I wish I could become a 1 car household (just for paying off debt sakes). But I travel 80 miles a day for work and my husband is on a different time schedule with me that would interfere in being a 1 car household. If only I could get rid of my car and its payment! Definitely do it! I had a lot of fun.